Marianne - Climbing and More: Dutch Drytool Event! 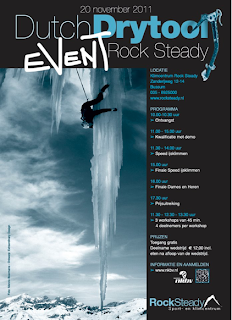 This Sunday climbing gym Rock Steady in Bussum will be filled with iceclimbers, sportsclimbers and all other kind of climbers who want to try out iceaxes! Petzl just told me they'll provide iceaxes for the comp so everyone, even if you're 'just a sportsclimber' you can join this fun comp. After the finals there's a free meal for all volunteers and competitors and we'll of course watch the newest iceclimbing movies. More info in the NKBV website, my Facebook page and spread the word! Note: on the NKBV site it says 'inschrijving gesloten' (subscription closed) but that is nonsense of course, just come to Bussum this Sunday and subscribe there or on the event page on Facebook.